This post is by way of being a ‘soft launch’ for a new Honest History series. We are using the series to explore a crucial question: whether what happened at home in Australia during the Great War was actually more important than what happened overseas on battlefields. More important in the effect it had on Australia, on individuals, on families, on social structures. 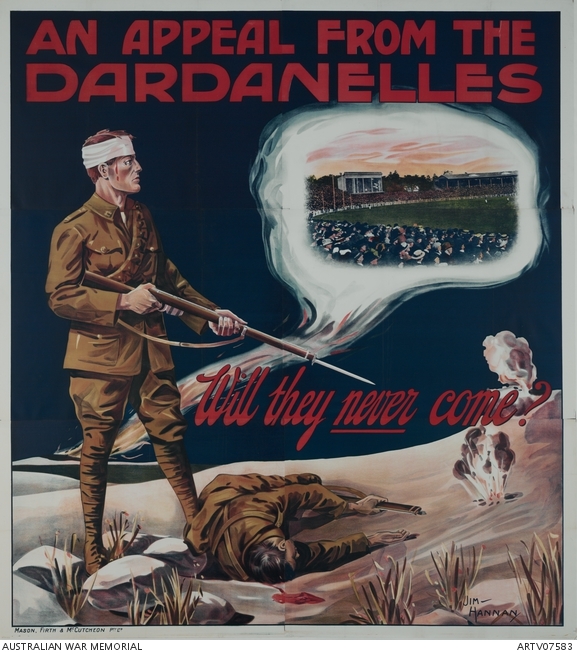 This suggestion challenges the dominant interpretation of Australia and the Great War, which for a century has focused on the exploits and fate of young men in khaki, many of whom died on Gallipoli, on the Western Front or in the Middle East. But was their service the most important aspect of Australia’s Great War? Should it remain the dominant narrative? Is the real story what war did to us – to Australia and Australians and to the rest of the world – not what we did in war? Shire at War notes that these meetings, in Yarram as elsewhere, were intended to involve the community as well as round up young men for the AIF. Large posters tugged at the emotions. German barbarity was emphasised, contrasted with the virtue of the British Empire. There was an element of frustration that recruitment meetings were even required. There were heavy hints that conscription would be necessary. The Yarram meeting planners and speakers – predominantly the leading citizens of the district, as Shire at War‘s research shows – made remarks that pointed up the divisions in the community. There were unmarried slackers playing football and married men doing the right thing; drunken pub lizards and clean-living soldiers; those who avoided their obligations under compulsory military training and those who did their time; men whose teeth were so bad they would fail the medical and sound young men with sparkling white teeth; those who did not enlist and those who did; ‘shirkers’ and ‘patriots’; the local elites who did the spruiking and the broader base of citizens who responded – or not; those who gave in to the pressure and showmanship of the recruiters, or of their own peers, and those who did not and quietly kept their heads down at home; those who thought war would be a great adventure and those who read the casualty figures and thought of other things to do. These divisions underlay recruiting efforts throughout the war; numbers never again reached the levels of July 1915, as the figures in Appendix 2 of Joan Beaumont’s Broken Nation (drawn from Ernest Scott’s volume of the Official History) show. The Victorian recruitment figure for July 1915, 21 698, was by far the largest figure for any month for any state throughout the war. HJM Campbell would not have read the letter until after Syd’s death – and after the rousing speech.